Syria’s internet is carefully monitored and regulated by local authorities and the country is one of the most dangerous places in the world for journalists and bloggers. There are sophisticated technologies in place to filter political, social, and religious websites. In this article, we'll show you how to bypass censorship by using a VPN and discuss the advantages of using a VPN. Using a Virtual Private Network (VPN) in Syria is a proven method to help keep your online activity private and more anonymous. VPN software encrypts all internet traffic going to and from your device and lets you access websites and apps that might otherwise be out of reach due to state-mandated restrictions. It’s also a hardy choice to access geo-restricted streaming media services such as US Netflix. As such, this article will discuss the reasons why folks in Syria should use a VPN and the best ones for this purpose. ExpressVPN: Easy to use, able to unblock a variety of streaming services, and has high-speed servers. NordVPN: A great budget option with an expansive network and strong unblocking capabilities. Cyberghost: Inexpensive yet versatile VPN offering good value for money. IPVanish: Reliable service that you can use simultaneously on up to 10 devices. A VPN routes all the web traffic flowing to and from your device via an intermediary server. This makes host websites and apps think you’re in a different location and opens up libraries of content that might otherwise be inaccessible. The encryption aspect keeps government and surveillance agencies at an arm’s length. ExpressVPN comes equipped with top-notch encryption standards, incorporates fast speeds, and offers a server network that traverses the globe. This provider gives you options of more than 2,000 servers around the world. It can easily unblock a variety of geo-restricted streaming media services, including US Netflix, HBO, Hulu, Amazon Prime Video, and more. Live customer support is available around the clock in case you run into any problems. This is one of the toughest providers out there from a security and encryption standpoint. ExpressVPN uses 256-bit AES encryption, which is considered to be within the elite category of VPNs. Included is a built-in internet kill switch, which it refers to as a ‘network lock,’ along with DNS leak protection, so your information always remains within the VPN encrypted tunnel. ExpressVPN doesn’t store any detailed user logs, such as IP addresses. ExpressVPN offers apps for Android and iOS, as well as desktop clients for Windows and MacOS. A single subscription allows for three simultaneous connections. BEST VPN FOR SYRIA:ExpressVPN is our #1 choice. Fast speeds, strong security and excellent customer service. The deal includes a 30-day no-quibbles money-back guarantee, so you can try it risk free. NordVPN is known for a privacy-focused reputation. Its network of more than 5,100 servers spans 62 countries and has plenty of options all over the world. NordVPN streams HD video without any discernible buffering. We put it through the paces in our user review and the service responded well by easily circumventing blockades on sites such as US Netflix, HBO, Amazon Prime Video, ESPN, and more. Users can take advantage of options to select a server that optimizes certain tasks, including streaming HD video and double VPN. NordVPN does not store any user data and there are no exceptions to this rule. Its servers were confiscated on a couple of occasions but no incriminatory evidence was found. Security protocols include 256-bit encryption, the OpenVPN protocol, an internet kill switch, and DNS leak protection. BUDGET OPTION:NordVPN is a low cost option, combining fast speeds, numerous security features, and exceptional unblocking capability. Includes 30 day money back guarantee. CyberGhost has upped its game in recent months. This provider delivers a robust product at affordable prices and offers a little over 3,000 servers spread across 60 countries. This provider’s streaming and unblocking capabilities are valuable additions to the product. The proprietary VPN client helps guide users through the specific process of unblocking streaming services, including US Netflix, BBC iPlayer, Amazon Prime Video, and many more. Just select “Unblock Streaming” mode on the main screen and follow the step-by-step instructions that come next. But streaming isn’t delivered at the cost of privacy. CyberGhost offers 256-bit encryption, perfect forward secrecy, an internet kill switch, and DNS leak protection. Additional security features are an ad blocker and anti-malware defense. This provider doesn’t store any user data, including IP addresses or similar data points that could identify individual users. Its registration in Romania means it’s also safely out of the reach of any data retention laws. You can access the service on Android, iOS, Windows, or MacOS. A single subscription allows for seven devices to connect concurrently. FAST SPEEDS:CyberGhost is secure, fast and inexpensive. It’s very easy to use, even if you’re not very tech savvy. 45-day money back guarantee included. Read our full user review of CyberGhost. IPVanish is an excellent choice when it comes to both speed and privacy. It’s a rarity in the VPN world in the sense that it independently operates its entire network of servers – most services either outsource or rent space. This gives it firm control over all user traffic. At the time of writing, it has 1,100 servers in over 60 countries. Military-grade encryption protocols are par for the course. Web traffic is secured with 256-bit encryption, perfect forward secrecy, DNS leak protection, and an internet kill switch. IPVanish is similar to NordVPN in the sense that it doesn’t store any user data, meaning there’s no retention of traffic or connection logs. This provider is a known favorite with torrenters and Kodi users for a few reasons. Firstly, it enables them to download the Android APK directly to their device. The second factor that attracts them is the fact that the interface is remote control-friendly for Kodi devices that usually lack a keyboard and mouse. IPVanish unblocks several streaming media sites, including BBC iPlayer. This provider allows 10 devices to connect at the same time, which is significantly higher than the industry standard of five. Another valuable upgrade is its addition of 24/7 live chat for customer support. It offers apps for Android, iOS, Windows, and MacOS. PROTECT YOUR DEVICES:IPVanish has high speeds and a few unique security features, making it ideal for those who often use multiple devices to access the internet frequently. 7-day money back guarantee. PrivateVPN has quickly endeared itself to VPN enthusiasts, despite being relatively new to the industry. It delivers fast speeds with solid encryption protocols to back that up. This provider focuses on delivering quality over quantity which means the server offering is relatively tiny – with just under 90 servers in 56 locations. But this shouldn’t dissuade you from opting for the service because it does the job very well. Some of the sites it unblocks easily are Netflix, BBC iPlayer, Hulu, HBO, and Amazon Prime Video. Strong security and privacy features are also built in. Users can opt for either 128- or 256-bit encryption depending on the chosen protocol and are also offered perfect forward secrecy, an internet kill switch, and DNS leak protection. A basic plan allows for six devices to connect at the same time. The provider offers apps for Windows, MacOS, iOS, and Android. FAST STREAMING:PrivateVPN is fast and reliable. Unblocks Netflix, BBC iPlayer and Amazon Prime Video. Full 30-day money back guarantee. Should I use a free VPN in Syria? As mentioned earlier, Syria’s internet is under strict surveillance by state authorities. For users looking to enjoy unfettered access, it’s crucial to opt for a VPN provider that delivers top-tier levels of privacy, encryption, and speeds so that government blockades are sidestepped without any problems. Free VPNs, unfortunately, won’t deliver on this promise. Most free VPN providers attempt to build a bare-bones product that barely gets the job done. This helps lure unsuspecting users and allows the company to monetize its service via advertisements or frequent upgrade requests. Free VPNs won’t offer you the same levels of customer support, encryption, and speed that their top-rated competitors will. Instead, be prepared to endure wait times to connect to a server, bandwidth throttling, and sharply reduced speeds. What’s more, there are examples of free VPN services with questionable ethics; some have engaged in acts like leveraging user bandwidth to build botnet armies, and infecting host devices with malware in order to mine data. We believe it’s in your best interests to avoid using free VPNs when browsing the internet. Why should I use a VPN in Syria? Despite the ongoing war in the Middle Eastern country, Syrian authorities still take it upon themselves to actively block and filter content. In some areas, the internet is a crucial lifeline for communication, particularly when mobile phone networks may be jammed. Internet advocacy body Freedom House terms Syria’s internet landscape as ‘not free,’ pointing to the arrests of bloggers and regular blockades of content as areas of concern. In 2017, it says 15 digital activists and bloggers were detained by law enforcement authorities. Comparable figures for 2018 are not yet available. Other citizen journalists and bloggers were killed when reporting on the conflict, with both sides taking the blame. The report adds that hackers from Russia, Iran, and the Syrian government were tasked with conducting malware and spear-phishing attacks against prominent human rights organizations, in an effort to steal their data or wipe out their databases. In some cases, the internet has been completely shut off prior to regime attacks with Syrian residents having to resort to Turkish mobile signals in order to get online. Freedom House attributes this heavy-handedness of the state to the fact that the internet has been used to document human rights abuses by ordinary citizens, with some of the material picked up by international news organizations, too. The Syrian government blocks a host of politically charged websites that are critical of the regime, most notably some that are Lebanese- or Jordanian-run. It engages in this censorship with several commercially available software programs such as ThunderCache, which utilizes deep packet inspection to throttle access. There’s also evidence to suggest that Italian company Area SpA has worked closely with Syrian authorities to further flex its censorship and surveillance abilities. Some of the recommended VPNs in our list will guard against this technology. A VPN is also a recommended option if you plan to engage in torrents regularly. While it’s unclear whether torrenting in Syria is allowed or not, it’s better to remain on the safe side. How do I blog safely in Syria? News organizations, as well as the general public around the world, depend on citizen journalists and bloggers for firsthand information regarding ongoing events in Syria. However, those relaying information could become targets of the state or rebel groups. Therefore, it may be in your best interests to obfuscate your identity while trying to blog safely in Syria. Using a VPN can help, obviously. But for a detailed, step-by-step process we encourage you to read our guide to blogging safely. Follow these steps to obtain a foreign IP address while currently in Syria:The first thing you should decide on is a provider that meets your requirements. We encourage you to base your decision on both the mini-reviews as well as the detailed user reviews referenced at the end of each one. Once you’ve made up your mind, simply sign up with your credit card information. Some providers also accept PayPal, Bitcoin, and other payment methods. Download the relevant apps for your device directly from the provider’s site. Restart all devices once installation is complete. Open your VPN app and use it to connect to a server of your choice. Congratulations; your internet activity is private and secure. Netflix does not actually operate in Syria due to US government restrictions. Therefore, if you’re an international development worker living in the country for work, you won’t be allowed access to the service if you log in with a Syrian IP address. The only way to access Netflix is if you install a VPN first. The largest library of Netflix content is available in the US, but you can access other catalogs by connecting to the appropriate VPN server. If you try to use a VPN that doesn’t support Netflix, then you’ll probably be shown a proxy error message. It’s better to opt for one on our recommended list instead. Most of them work with Netflix, but it’s a good idea to check with customer support in case you run into any problems. 7 Should I use a free VPN in Syria? 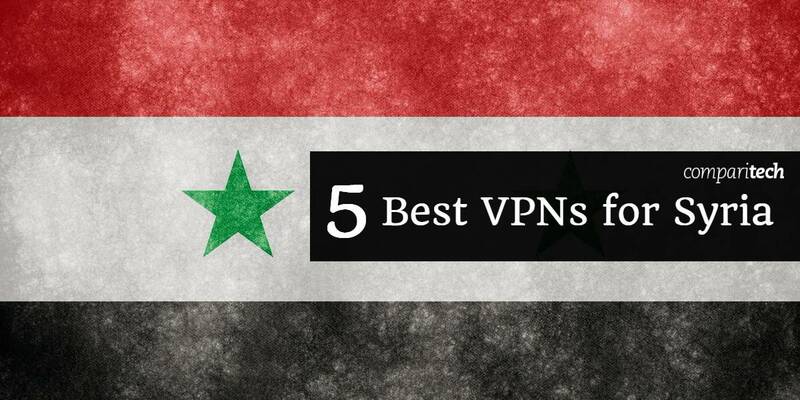 8 Why should I use a VPN in Syria? 9 How do I blog safely in Syria?